like basically everyone else on the planet, i have a nostalgic, disproportionate love for funfetti. i know that it's really just vanilla cake and sprinkles...but who doesn't love vanilla cake and sprinkles? this girl certainly does love both of those things. 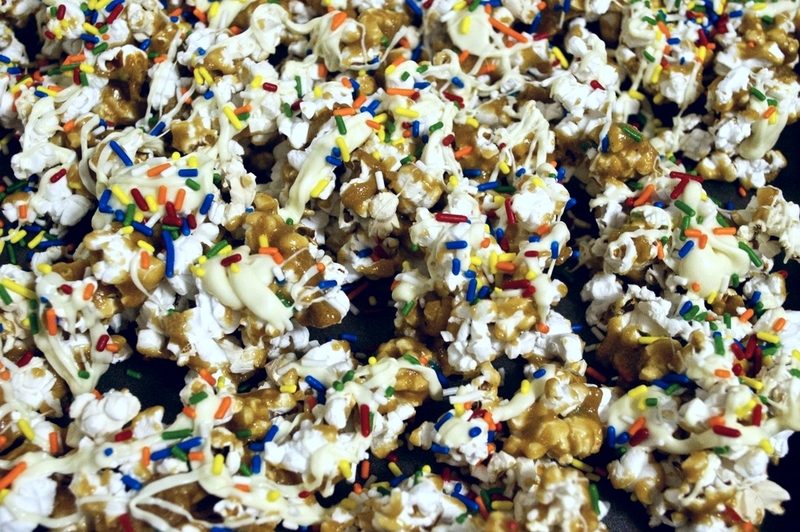 i also love to mix a little salty with my sweet, which triggered the idea for this caramel corn – light, airy popcorn, sweet caramel with a hint of salt, and, of course, lots and lots of vanilla-y white chocolate and festive rainbow sprinkles. how can you not get excited when you see all this colorful, rainbow-flecked, sweet-and-salty goodness?! i actually seriously recommend doubling this recipe. Seven cups of popcorn may sound like a lot, but really, it barely covers the bottom of a large sheet pan. and you know that as soon as you say the word "funfetti" to your family, friends, coworkers, pretty much anyone you speak to ever, they're all gonna want some, and you want to make sure you save at least a little tiny bit for yourself, believe me. 1. start by popping the popcorn kernels. 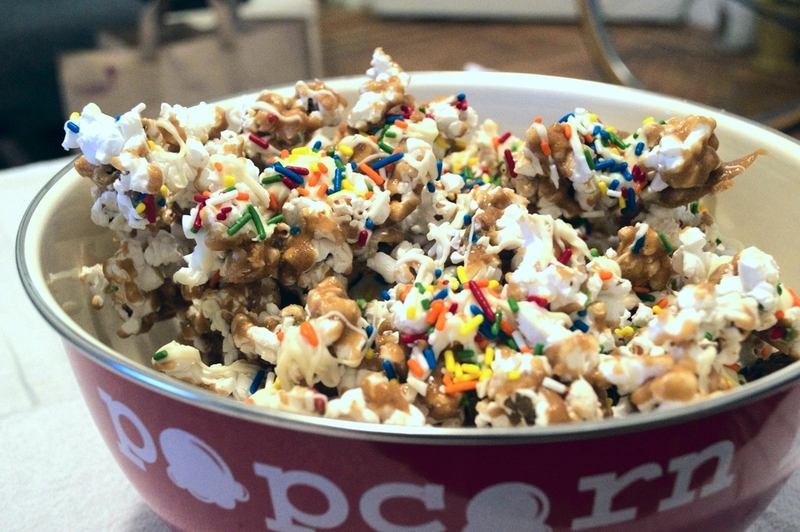 if you don't have a popcorn popper (i certainly don't), then try the super simple method of air-popping in the microwave used by sally of the amazingly awesome blog sally's baking addiction. put 3 tablespoons popcorn kernels into a basic brown paper lunch bag, fold over the top a couple of times to seal it (but leave plenty of room, of course), and microwave for 1 minute and 30 seconds (i found that if i went to 1 minute and 45 seconds, as suggested, my popcorn came out a little burnt, but every microwave is a bit different, of course). i did this 3 times to fill one large baking sheet and make the 7-ish cups needed for this recipe. 2. spread the popped corn out on a large sheet pan. preheat the oven to 225°F. 3. make the caramel: put the first 8 ingredients (everything but the sprinkles and baking soda) into a saucepan. over medium heat, melt all the sugars and fats, stirring constantly, and bring to a boil. boil mixture for 5 minutes, then remove from heat and quickly stir in the baking soda (it will foam up a bit at this step, so be cautious). pour hot caramel over the popcorn, and gently stir together until the popcorn is coated with the caramel. put the sheet pan in the oven and bake for 1 hour, stirring once or twice during cooking. allow to cool 10-15 minutes before moving on to the next step. 4. meanwhile, melt the white chocolate in the microwave – microwave in 30-second intervals, stirring in between, until completely melted. to temper it (i.e. ensure it will set on your popcorn at room temperature), make sure you bring the melted chocolate up to 110°F, and then while stirring and adding in more chips, bring it back down to about 86°F before using. 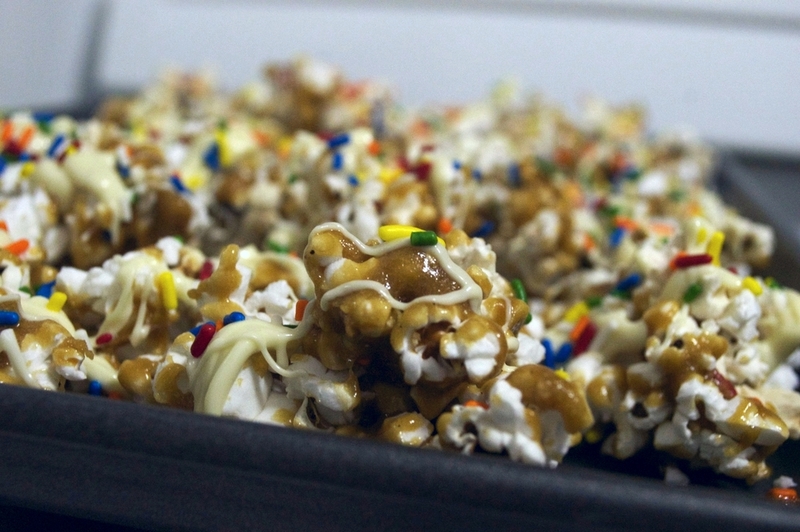 drizzle the melted white chocolate over the caramel corn and sprinkle evenly with the remaining rainbow sprinkles. and of course, if your chocolate doesn't set the way you envisioned, you can always pop the final product in the fridge for 15-20 minutes before eating or packaging. i didn't eat this entire bowl by myself...just most of it. i don't even feel badly about it. and it makes such a pretty gift! who wouldn't want to receive a prettily wrapped bag of this sweet stuff?